CNN Chief Medical Correspondent Dr. Sanjay Gupta was on assignment in Haiti. On Thursday he reported on the challenges facing newborns in earthquake-devastated Haiti. You’ve decided to do a triathlon…now what?! 1. Sign up for a sprint distance triathlon! I put this first as you will then have no option but to complete steps 2, 3 and 4, listed below. * A good Web site for locating races is www.trifind.com. * Give yourself at least 2 weeks to purchase equipment and find a local team, then give yourself about 12 weeks to train. * Read about the race course and know what to expect (hills, flat, etc.). * Check the water temperature for your swim. Low-to-mid 60s can be cold but doable, low-to-mid 70s is very comfortable. * Find out how many participants there will be. A more intimate race, roughly around 300-500 racers, is better for your first experience. Save the 5,000-participant race for later. 2. Go shopping! This is the fun part. If cost is an issue, lots of stuff can be bought online, often at a discount. Remember that whatever you buy will last for years to come. * Road bike – No mountain or hybrid. And no tri bike til you’re ready for your second bike. * Cycling Shoes – You must clip in! In order to pedal efficiently, you must connect to your pedal crank. No buts, just do it. * Clipless pedals and cleats. * Spare tube, CO2 cartridge/dispensor, tire lever – You will have to change a tire someday. Don’t get stranded 10 miles from home with a flat and no way to fix it. * Floor pump – You should pump your tires before every ride. * Sneakers and speed laces – You’ll never want to tie your shoes again! * Swim cap and goggles. * Wetsuit – So NOT fun trying these on as they are much more comfortable in the water. * Extras that can wait, unless you decide to go for broke: Sunglasses, carry bag to attach to your bike, allen keys for bike adjustments, front and rear bike lights (if riding at dusk or dawn), water bottles for your bike, heartrate monitor, cadence/mph monitor for your bike (when your ready for the “gadget phase”), tri shorts (padded bottoms are nice), water-wicking clothes for training, hat or visor for sunny runs. * Good Web sites for discounts: www.craigslist.org, www.nashbar.com, www.performancebike.com. * How many coached sessions do they offer weekly? * Are there other beginners for you to train with? * Do they have a pool facility? * Do they offer open water swim clinics? * Will they offer lectures such as “how to change a tire,” “nutrition,” “transition practice,” etc.? * Do they receive discounts at any local swim/bike/run shops? 4. Show up and have fun! That’s all you have to do. Just show up to your training sessions and let the games begin!! See you at the finish line! CNN Chief Medical Correspondent Dr. Sanjay Gupta has been on assignment in Haiti, covering the earthquake aftermath. He talks about the girl pulled from the rubble after 15 days and answers other questions. What is the risk of HIV infection in Haiti? How are you protecting yourself from AIDS while trying to help people in Haiti? I know AIDS was already prevalent there. Lise, thank you for the question. Whenever possible, all medical professionals here in Haiti are following normal medical hygiene protocols; we wear gloves and make sure medical instruments are sanitized even if in some cases that’s done with alcohol. Just to be clear, HIV, the virus that causes AIDS, is not easily spread. In fact according to the Centers for Disease Control and Prevention, the chances of a health care worker becoming infected with HIV from an open cut or even an open wound is no higher than approximately .3 percent. In recent years, Haiti has shown some improvement in infection rates and antiretroviral use. As of the United Nations’ last report, Haiti has lower HIV/AIDS prevalence than the Bahamas. According to the World Health Organization, two thirds of HIV infections are in sub-Saharan Africa. A couple of days ago, a man was stoned to death about a block from where we are staying in Port-au-Prince, Haiti. I have been down here nearly two weeks covering the earthquake devastation, having arrived quickly the morning after it occurred. I didn’t see the stoning myself, but several of my colleagues described a man who had been trying to steal money and was met with swift and deadly citizen justice. A lot was made of this particular tragedy, and if you caught only that headline, you might be left believing the incident was in some way emblematic of what was happening all over the place. Truth is, even though I braced myself to see rampant lawlessness and mob hostility, I wanted to blog about what I have actually seen. As I drove through the streets of Port-au-Prince, just 16 hours after the earthquake, I was met with stunned stares and unfathomable grief, as parents tried to dig their babies out of the rubble and older kids did the same for their parents. It was heartbreaking. And though we raced out with our first aid bags to help those we could, it seemed like we would never be able to make a dent in the suffering. There were people who died in this earthquake and those who lived – but there were also a large number of people somehow caught in between. They were alive, but terribly injured and dying. That is where we focused our attention. Terrible crush injuries of arms and legs. Degloving injuries, where the skin of the arms or legs was ripped away. And, people so malnourished and dehydrated that they could barely walk. I expected to see those stunned stares turn to desperation, and that desperation turn to brutality. It didn’t. In fact, I remember driving by a water station that had finally opened on January 18th, five days after the earthquake struck. It stayed in my mind for two reasons. 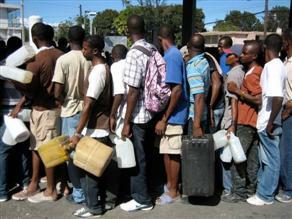 First of all, five days is a long time to go with little to no water, especially in Haiti heat. Second of all, there was no pushing, shoving or aggressive behavior. There were no armed guards and there was a tight line, with people waiting patiently. Some were even singing songs, while blistering away in the heat. I almost cried. A piece of my faith in humanity, which had been trashed by too many terrible images, was slowly restored. A couple of days later, I was seeing patients at one of the hospitals in downtown. It was actually more of a tent city situated outside the hospital, where care was sparse and misery was thick. Helping care for wounds, evaluate injuries and even perform surgery – every single patient said thank you, in Creole, French and English. Thank you. When recounting this to a neurosurgery colleague of mine, he reminded me that we could often go months working at a county hospital in the states without ever hearing those two words. Over the last two weeks, I have not seen the violence Haiti has been known for in years past. During this time, when lawlessness had been put to the test, it seems the people of Port-au-Prince stood tall, dignified and with respect for one another. Yes, there has been “looting” from stores of supplies. But, is “looting” even the correct term for people taking basic necessities for themselves and their families? Instead, it is just survival, and faced with the same situation, I would’ve likely been right there with them, wanting to preserve the lives of my wife and children. Consider this a blog that went beyond a headline, and presented a reporter’s on-the-ground view of this very important issue. I won’t pretend that this is more than a slice of life in the aftermath of a terrible natural disaster, but it is my slice, and I wanted to share it with you. Thank you – for reading it. Starting over in a quest to get fit. Again. Two weeks after meeting my fellow Fit Nation Triathlon Challenge participants, I can safely say that my runner’s high (fitness high?) has worn off. After I returned home from our first appearance on CNN, the reality of what it will take to get a healthier - and hopefully less hefty - me across the finish line in July really set in. I guess some small part of me expected the enthusiasm of working out with our head trainer, Laura Cozik, to miraculously melt my fat cells and firm me up a bit. One step on the scale and two long looks in the mirror quickly helped me snap back to reality. Since being selected in December, I’ve wondered what thing - an attitude? a feasible plan? - I’ll have to develop in order to complete this challenge. I submitted my video because a) I’m tired of losing and gaining the same 10 to 20 pounds, b) I want to break the cycle of obesity-related disease in my family and c) I want to help people like me see that we really can be the fit people that we want to be, despite busy schedules, complicated family histories and all. The finish line in New York will be the starting point of a lifestyle committed to my own fitness and well-being so that I can be better than I have been for the first 30 years of my life. That takes learning how to live all over again. What brought me to this point - having regained 20 of 30 pounds I lost two years ago, embarrassed about my backslide (and my backside, ha ha) and determined not to let it happen again - are a jumble of behaviors and habits I’ve practiced in an ongoing battle to lose weight and keep it off. This time, I’m out to get fit forever. When diet programs place an asterisk next to a standout weight-loss winner’s shed poundage, the “results not typical” disclaimer is a reminder that there’s a reason big, permanent weight loss and improvement in wellness don’t come via quick fix. The evolution of going from couch potato or even moderately active to truly fit takes un-learning all of your bad habits, and retraining mind, body and spirit to embrace new ones. When I realized this two weeks ago, I freaked. Bringing the kind of change I see in my mind’s eye will mean turning to exercise instead of chocolate, margaritas or my favorite meal when I seek comfort at the end of a long day. It will mean learning how to say ‘no’ to more activities in order to provide myself with ample time for rest, recovery and reflection. It means separating the haters from the celebrators as I work to be better than I have been before. And in a generally un-American fashion, it will mean that all of these changes will have to occur s-l-o-w-l-y. So instead of relying on the strategies that have worked with an expiration date, I’m using this time to re-learn the way I live. Whereas I’d normally start my workout regimen with a commitment to sweat for 45 minutes to an hour a day, seven days a week, my training for the tri begins with a 15-minute run two days this week, a 40-minute bike ride on two other days, a 30-minute session in the pool, and two days to do nothing. Instead of cutting sugar cold-turkey (a practice that has helped me lose pounds and friends as I become increasingly irritable), my nutrition plan allows me to include just a little here and there. Eventually, I’ll wean myself off that white horse, but I don’t have to torture myself (or others) to do it. Going slowly will probably be the hardest part of my triathlon training, but I have six months to find my groove, and a lifetime to sustain it. I hope you’ll join me. CNN Chief Medical Correspondent Dr. Sanjay Gupta is on assignment in Haiti. He checks in on doctors who have traveled to Haiti and are preparing to treat injured patients. CNN Chief Medical Correspondent Dr. Sanjay Gupta is on assignment in Haiti. He and his crew take care of earthquake victims overnight at a field hospital. CNN Chief Medical Correspondent Dr. Sanjay Gupta is on assignment in Haiti. He and his crew discuss how they were pulled into action, with CNN producer Danielle Dellorto turned "nurse" and his cameraman turned "medic" to care for quake victims overnight in Haiti. CNN Chief Medical Correspondent Dr. Sanjay Gupta is on assignment in Haiti. He reports that PTSD and fear of another quake are paralyzing many survivors in Haiti.